Fast50s pod style Hi Flo air filters for various carb sizes. Made by UNI! Remove of that stock air box and let your engine breathe and perform better! Angled Blue Hi Flo Foam and 3" in length. Picture is reference only, Colours may vary. Please state which size is required when ordering! This fantastic piece of kit just plugs directly into your exisiting wiring harness. This makes the stock ignition rev way better from bottom and mid range for more torque, with a bit more over rev as well. Also works from 1988 Honda z50 (12 Volt). Just plugs right into your exisiting wire harness and allows your bike rev a bit more throughout each gear. Also gains in responsiveness through out! A easy plug in power gain for your 50 or 70! This is the best pipe on the market for your 50, its stainless for durabilty and shine and it weighs just a fraction of your stock exhaust. This pipe runs similar on the bottom end to your stock pipe, but then takes off with a incredible mid range punch, which is really what your 50 needs! It also has a bit more top as well. Works great on 50cc all the way to over 88cc. We even recommend running this on your 106cc bikes for tight tracks. Also available in 1 inch for 106cc to 124cc bikes! Help your engine breathe better with this Takegawa Breather Kit, available with a blue cap. Very easy kit to install and this item relieves pressure in the head of your 50's engine. These Magnetic Drain Bolts collect all the metal shavings that wear in your motor, preventing further wear in the engine. When you change your oil you can pull out all that gunk. Aside the fact that your cleaning your motor with this magnetic bolt, your oil plug now looks trick too! Now its time to get serious with some real power upgrades, this will help your bike pull better throughout the entire power range and increase you top speed slightly.More lift and more duration than your stock camshaft. Makes your Honda 50 pull better through the entire power range.This Takegawa High Lift Long Duration performance camshaft is for Honda xr/crf 50 and 12v z50s. Marked down price! This camshaft is for your stock 50 head and also has "NO Core" Charge at all. This item in-combination with the Powroll Piston Kit, UNI filter and Fast50s Speed Exhaust will really make your 50 destroy the opposition! Powroll Super High Compression Piston Kit - for Stock 39mm Piston, 15:1 Compression. This stock size kit installs in your standard cylinder -- no boring required. Legal for most 'stock' mini classes. Single best performance mod you can do (without going bigger on displacement). KIT INCLUDES: Forged piston, pin, rings, circlips, head gasket, base gasket. REQUIRES: Check clearances before installation. Under 2,000' elevation, run 100+ Octane. Over 2,000' elevation, Premium Pump OK.
AHP 4 speed 1 down 3 up transmission, hardened gears and shift forks. This transmission kit is made for those wanting to upgrade their stock Honda motors from a 3 speed to a 4 speed. AHP's transmission kit will work with both semi-auto and manual clutches and will fit into a OEM Honda bottom end. Will also fit import motors with the crank mounted clutch. Recommended for engine builds up to 117cc. Set comes complete with main shaft and gears, counter shaft and gears, 15t front sprocket, shift drum and hardened shift forks complete and installation diagram. Will be shipped assembled for you! 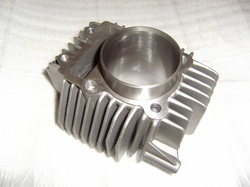 The AHP 4 Speed Transmission Kit uses a Honda Z50 sprocket which is NOW INCLUDED with all transmission kits from 9/22/08. Uni Air Filter Service Kit for all Uni Filters! Uni Filter Cleaner's powerful agents strip away grease and dirt, yet won't damage the foam. Just spray it on, let is soak, and rinse away. Safe to use on all OEM and after market filters. UNI make the best filters in the world with fantastic air flow and quality, this item would be greatly matched to one of our filters on the left! These genuine rounded oval shaped Fast50s stickers measure 4.5" in length and 1.5" in height. Available in either black or white! Price is for one sticker only! 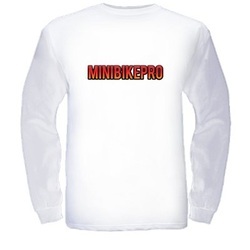 Here are our new MiniBikePro Long Sleeve T-Shirts in White & Black! (Also available in short sleeve). 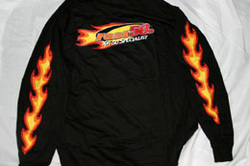 Fast50s T-Shirt with Flame logo. Not a cheap brand - Thick - Port & Company shirts. This T-Shirt is 100% cotton. Comes in four colors (Black, Blue, Red, or Grey), Sizes from small to XXL. Please specify when ordering! Fast50s Jersey with the Flame logo, only available in black. Fast50s only use high quality Hanes Beefy brand for their Jersey. Available in small to XL, just state when ordering! Stay warm with this black or grey hooded sweatshirt with a pouch. Fast50s flame logo on front and back as well as large flames running up the arms. These are High Quality Thick Hanes Ultimate Cotton Line! Not made of cheap thin fabric like other companies!